Toulon Freestanding Soaking Tub 69"
Name: Toulon Freestanding Soaking Tub 69"
Toulon Freestanding Soaking Tub Modern Cast Stone 69"
The Toulon modern bathtub is the perfect place to relax in ultimate luxury and indulge in a tranquil state of mind. 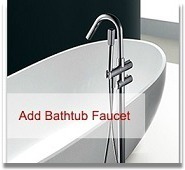 The Toulon modern bathtub is a solid surface, luxury bathtub with a polished satin matte finish. Unlike your common hollow bathtubs that are made of fiberglass, the modern solid surface bathtub is made of crushed stone mixed with molecular compounds and advance composite materials, therefore leaving you with a hypo-allergenic traditional bathtub. The slick non-porous feature of the solid surface bathtub contributes to your personal hygiene by working as a natural deterrent for bacteria, making this modern bathtub stain resistant and simple to clean.